Contents: Layered chef salad (lettuce, thinly sliced cucumber, carrot, grilled chicken, shredded cheddar cheese, boiled egg, two blueberries (just for looks) and tomato slice), homemade blueberry bread, honeydew, and strawberries. Not pictured: container with dressing for the salad. 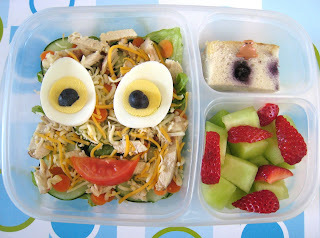 Notes: These bento style lunches seem to be very popular these days. They are certainly a far cry from the bologna sandwiches and carrot sticks I ate growing up. Perhaps this is something my wife and I will have to try when our kids are old enough for school. It looks delicious and fun for kids, but I have yet to figure out how to keep it looking cute once the lid is on and it's thrown in a backpack. Is it possible? I'd love to know. Great for at home though.